Today should be the day to post Madison's back to school photos. But instead her backpack sits sad and empty on the coathooks waiting for the teacher strike to end. 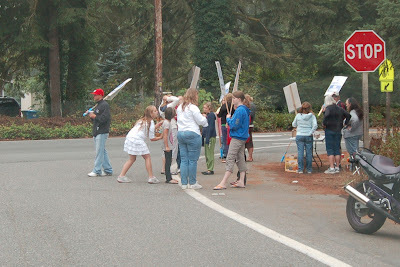 So we packed up some snacks and drinks and went over to the picket line in front of the school to say hello. Instead of meeting her teacher in the classroom, Madison met her on the picket lines. Not sure if that is appropriate or not, but not sure how else to deal with it. I have to say I LOVE her teacher and am so excited for school to start so she can have a great year. She has a great class of kids, a fantastic teacher and I just know it will be great IF it ever gets started.... Both sides seem to be playing hardball so I have no idea how long this will go on. AND just to be fair I brought snacks to the office staff at the school too. They have been put in a really tough situation and it is certainly not the fault of anyone in the individual school offices. I have so many conflicted emotions about the whole strike and won't even go there on the blog. I just hope it can get resolved as quickly and peacefully as possible. I am not really sure why, but this summer has been void of our normal family hikes. I suppose a large reason is the majority of our weekends have been filled and we have chosen to be lazy on the few that have been free. This afternoon we decided to go on a "mini-hike" of sorts. Good to get the dog out for a much needed walk and to enjoy the great outdoors with the family. It certainly made me wonder why we haven't been doing more. Our destination was Nolte State Park. This is where I will have my next triathlon at the end of September, so I admit that I was doing a bit of research along with the quality family time. This is really the perfect family outing when you don't want to drive far. Not many people were around and it is out in a beautiful area with some great scenery. A 1.4 mile trail wraps around Deep Lake (that name terrifies me just a bit for the swim portion of the tri but I am sure it will be fine!). It is a very flat and easy trail, perfect for younger hikers. There are small trails leading down to the water and we found a great spot perfect for rock throwing. Madison wanted to explore each small trail, declaring that the regular path was a bit boring and she was looking for adventure! Along with the nice trail, there is a beach area for splashing and a playground which is perfect incentive for the weary hikers. The way we started the hike the girls didn't see the playground, although it was directly behind us. So at the end of the hike Madison realized that the mile walk truely wasn't necessary to access the playground and questioned the purpose for the hike just a little! This is definitely a site we will be back to many times. I think it will be a great location for fall foliage photos and just a nice spot for the entire family getting our weekend exercise. We lucked out getting lots of sun on the Washington coast, though the winds kept things a bit chilly for taking a full plunge. Still lots of fun jumping waves and we even had a little success convincing Micah to get her toes wet, though she wasn't happy about it! Okay, I promise that I am going to restrain myself and not post anymore beach photos. I just love our yearly photos from the beach and it is impossible to select just a few. I am currently trying to design our upcoming bathroom remodel all around family beach photos. We will see how that progresses. Thanks for putting up with the photo overload. But it has to be better than the endless rambling on some of my posts!!! I think we brought enough of the sand home to make our own beach in the backyard. It will probably be weeks before I can shake it out of all the items. But still it was lots of fun and worth the mess! Back from a few great days at the beach. By far the highlight was kite flying. Madison got the hang of it very quickly and started doing all sorts of crazy tricks. It took Nora a bit longer to go solo but by the end she was doing it too and was thrilled! Lots more beach pictures to come in the upcoming days. You will notice alot of quirky angles that I was experimenting with. What do you think? I ♥ my crew team/fan club! Tom and the girls were up and out of the house at 5:30 a.m. with me to get me to the start line way before I needed just because they know I have major anxiety about being late for things. Tom then had his bike and the bike trailer packed in the car and they rode around the course cheering me on from when I exited the water, started the bike and started the run. Then they road ahead on the trail parallel to our run and would stop ahead so they could cheer me on. Madison even ran a small segment with me and once as I ran by I hear Nora say "I love you mommy". If that doesn't give you an extra boost, I don't know what will!! I ♥ being on a team. I joined the Raise the Bar triathlon team/club the end of July. Something I have been wanting to do for quite some time. It was great wearing the team jersey and running by people you have never met but are wearing the same jersey so they give you extra encouragement. I ♥ going to practices with a coach and team, which is another benefit of Raise the Bar. I am all ready looking forward to a full season next year and all the benefits it will give. I ♥ all the "love" that was given along the race course from a boy playing his recorder, an African drum band giving you a needed boost up the last hill, a dad and his boy with a full drum set on the lawn and all the cheers and praise from spectators. I ♥ being an athlete and competitor again. It has been 15 years since I last competed as a real athlete but the competitive juices quickly started flowing again. I have missed it and look forward to setting goals and setting personal records as I move forward in this venture. I ♥ the gear! Tri shorts, jersey, wet suit, bike, shoes, headband and I have only gotten the tip of the iceberg! I ♥ starting the day at 5:30 a.m. gearing up to make my swim in Lake Washington and ending the day at 5:30 p.m. dipping my toes in the Pacific Ocean for the start of a much needed family vacation!!! I survived my first ever triathlon and am ready to do it again tomorrow!! Once I wake up and see how my body feels I may think differently about that though. What a day!!!! Tom and I got up at 5:00 and then grabbed the girls at 5:30 and threw them in the car. We had hoped they may go back to sleep but really knew better. They had me dropped off at the starting area by 6:30 and then they went to find a parking spot and get the girls dressed and eat some breakfast. My wave time was 7:40 so I was plenty early. But that gave me time to set up my transition area, talk with other competitors, use the bathroom numerous times, get my tires filled up and get a layout for enter and exit points for each stage of the race. 7:40 and the horn blasts for entry into the water. I was a bit worried about swimming in Lake Washington thinking it may be too cold or too choppy but it wasn't as bad as I had anticipated. 1/2 mile in open waters looks a lot longer than you would expect, though. 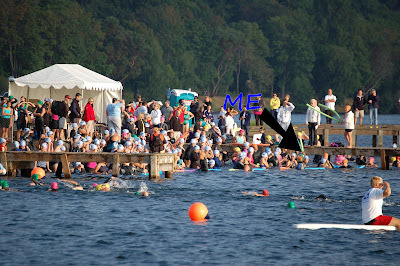 My biggest concern about the swim course was getting caught in the middle of the pack with arms and legs everywhere. So I choose to push my way to the front at the start line and go out in front. The strategy worked and I swam the first half in my own space before mixing in with prior waves but they were spread out enough it wasn't too bad. My swim time was my best individual ranking out of the 3 and I am pretty pleased with the time. HORRIBLE transition between the swim and the bike. It takes a long time to run your bike to the rack (mine was about as far as you can get from the water so that didn't help), peel a wetsuit off, wrestle a tight singlet onto a wet body, dry feet, put socks and shoes on... and then push the bike to the start of the ride (again I was the farthest away from that point). So Transition 1 is definitely an area to work on for next time. The ride overall felt great. It was fun to ride across Lake Washington on the I-90 bridge and go through the express tunnels. I felt really strong on the hills but I had a hard time sustaining good speed on the flats. I see speedwork on the bike in my future (Tom says I just need a new bike so maybe a shopping trip too!). Overall my ride time was fine but was my worst individual ranking out of the 3 legs, which seems a bit odd since it is the area I trained the most in. Transition 2 was better, mostly because there was no clothing or shoe changes involved, though I did need a bathroom stop which slowed me down. Then onto the dreaded run. I am not a distance runner, have never been a distance runner and probably never will be. So I had NO expectations going into this segment. The first mile was definitely the hardest and I had to do a few 30 second walks to rest my legs. Mile 2 I started to hit my stride and by mile 3 I was feeling relatively good. Even the hill at the end of the course was enjoyable, in a painful sort of way. I had a good burst of speed left to finish strong and in hindsight realize that I had too much energy left at the end of the race and probably should have pushed myself a bit harder. It is tough to know when you haven't done it before. Overall, I learned a ton and feel that if I had to do it again next weekend I could easily shave 10 minutes off my final time. Overall I am pleased with my time of 1 hour, 46 minutes and 40 seconds for a 1/2 mile swim, 12 mile bike ride and 3 mile run. I definitely know there is a lot of room for improvement and can't wait to get out there again! Okay, that was really long and I still have so much more to say so stay tuned for part 2 the emotional side of things. The girls are having a sleepover in Nora's room tonight. I went to check on them before I went to bed and this is what I found. They are such sweet sisters. Well.....most of the time! One of my biggest hopes and dreams is that they will stay this close as they grow up and will always be there for each other to hold their hand when it is needed. As much as I always thought I wanted to be the mommy to boys, I can not imagine anything better than my two girls. Madison created a paperchain for her door to countdown the days to the start of school. Only 21 days until she is a second grader. Just one more reminder of that sad day approaching. Don't get me wrong, I love the school shopping part! Although with attempts to reuse items from last year and no need for a new backpack or lunchbox our shopping sprees have been a bit limited. Just the basics this year, some notebooks, folders, pencils, crayon.... the typical stuff. Now on the other hand, I am not ready for school to start at all! Where did summer go? We didn't get to half the things on our Summer Bucket List and have very few free days to try and accomplish that. For the most part, the girls have been sweet sisters and I will miss our lazy days at home with them having time to play and create. I will miss summer concerts, days at the beach, long visits to the library and so much more...... Why does it have to go so quickly and why do our little ones have to grow up? It makes me want to just crawl into bed and deny it is happening! Of course, there is strike talk from the teachers who still have no contract so maybe summer vacation will be extended!!!! Though that would probably mean we would be going to school until July, so not really sure I want that either. *****On another note, I am having my countdown to my first ever triathlon. Only 6 days away AHHHHHHHH! I have all the instructions for registration on Saturday. I think I am ready but would prefer to have just a bit more training but I think it will be fine. We will soon find out! I am sure you have had this scenario happen to you. You run into the grocery store for a few items and get to the checkout line with your small amount of groceries. Ahead of you is that crazy coupon lady, you know the one! She has a huge stack of groceries and is obviously stockpiling cereal and crackers for Armageddon. She is pulling out her weekly grocery flier to debate a price of hair conditioner that wasn't ringing up properly, digging through her purse looking for that final coupon to add to her stack of 20 she is all ready using and having the checker take a look through all the bagged groceries to make sure she bought the correct cereals to match the coupon. All the time you are going crazy thinking "it is only 50 cents, just forget about it!!!!" WELL........... I have become that crazy coupon lady. Add that to my growing list of PTA commitments, playdates and household chore chart and I don't think I can become any more suburban soccer mom! 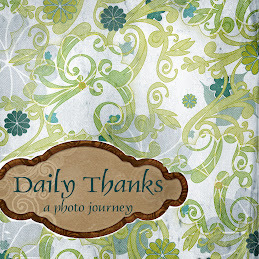 Still trying to decide if that is a good thing or bad thing:-) I have created a binder for my coupon organization. It is divided by categories (cereals, snacks, beauty, cleaning.....) with baseball card protector pages to keep all the coupons. Then I go through the sales ads and compare them with my coupons to do my meal planning for the week. I have to admit it is a bit addicting shopping for the best deal. Here is how I spent my Saturday night coupon organizing. And here is my loot from this week's grocery trip. Some of my better deals were 3 snicker's bars for FREE (not a good deal for my diet, but how can you argue with free candy??? ), FREE gallon of milk, $9 bottle of hair conditioner for 99 cents! I also got 10 boxes of Kellogg's products (cereals, snacks and waffles) that will average less than 75 cents each after sales, coupons and a $10 rebate I am sending in. Not bad!!!! In total today I had $19 in manufacter coupons, $14.50 in reward dollars for the store, 50 cent reusable bag credit and a $10 rebate for a total of $44 in savings and that doesn't include the savings for sale items that I grabbed for meals for the week. Now as crazy as my hubby may think I am, I am nowhere near as crazy as some of the people I find on line. Like check out this lady who is trying to have a grocery budget of $800 for the YEAR. Can you imagine? Most hard-core coupon queens will spend many hours store hopping to get deals at different stores. I have always valued my time as precious so am not to sure how much time I am willing to invest into going to multiple stores. 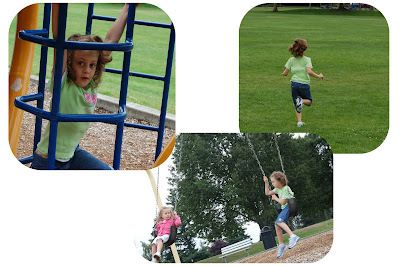 Once Madison starts school and preschool begins for Nora I may try and do a little more store hopping while the girls are at their respective schools but I still plan to do the majority of my shopping at my friendly neighborhood Fred Meyer. I figure as much as you can save by hopping from store to store, you also have that much more temptation to buy more than you need to negate any savings you may gain. If you want to jump on the coupon band-wagon with me just let me know and I will happily post some photos of my organization system and some of the more helpful websites and coupon sources I use. Happy shopping!!! Overall, our garden has been a bit disappointing. Not nearly enough sunlight to get the full bounty I had hoped for. Next year we will be doing alot more peas and broccoli as those were the most successful. The girls still enjoy going out to check on it and today I found Madison swinging blissfully while chewing on a stalk of celery she has just picked and she announced "Isn't it great that I can have celery whenever I want?" And yes that is definitely great. Our tomato plants are heavy with fruit but the ripening just isn't happening too quickly. I still have hope and won't give up! Still looking to go to a few more before the season is over. I fell in love with this handmade basket at the Maple Valley Market this weekend. It is a piece of art and a fabulous bag to add to my growing collection of handmade bags and purses (insert Tom eye roll here:-) I just LOVE it so much. The girls enjoyed watching the craftsman create a basket right in front of them. Very cool! It was an amazing bargain at $29 for something that takes up to 7 hours to make!! I am considering going to get more to keep on hand for gifts! It is the perfect size for so many uses - picnic playdates at the park, shopping treasures and it will even hold a scrapbook and some supplies for a crop event! PERFECT!